The stories of the Shreemad Bhagavatam describe the path of bhakti to reach Narayana, and the final days of the Shreemad Bhagavatam Course were rich with insights along this path. 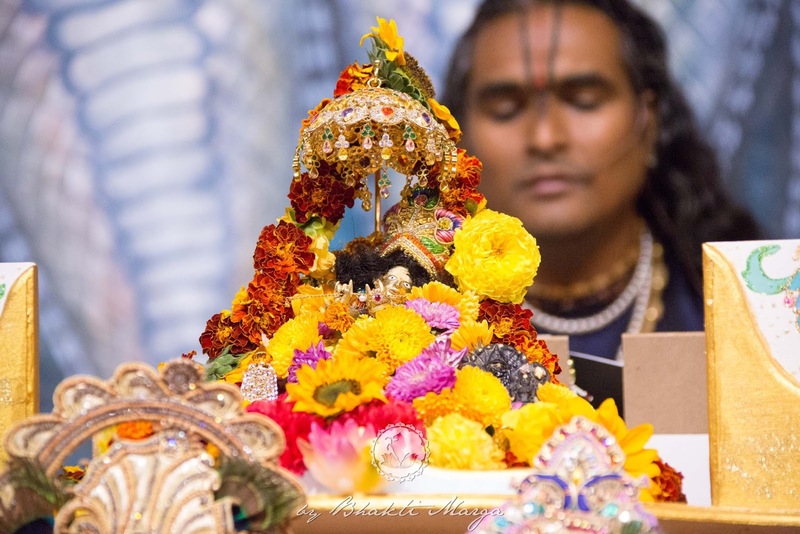 In many of the stories of the Shreemad Bhagavatam, Devarishi Narada teaches that if one wants to be free, the easiest way is to listen to stories of the Lord's Glory. 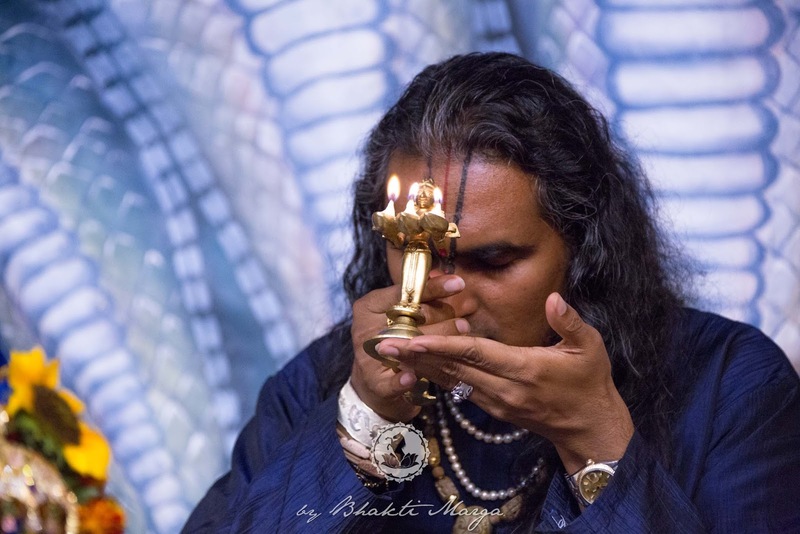 These tales awaken bhakti through Grace, and help calm our minds. Swamiji pointed out that these stories show that the misery we find is due to the expectations that we make. Hearing the stories of the Lord's Glory works on us in two ways: we get the chance to fill our mind with ideas about what is good and what is not, which helps us to act in ways that awaken positive qualities within us. But more importantly, when we find a spiritual master to hear the Glories of the Lord from, we practice humility. 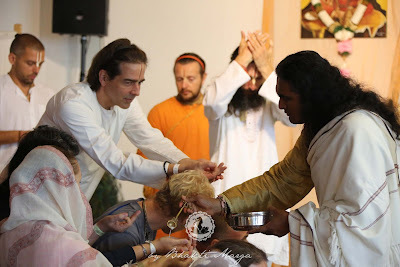 Sri Swami Vishwananda passing out prasad from the morning Giridhari puja. God Himself is very humble, as He demonstrates frequently in each of His incarnations. 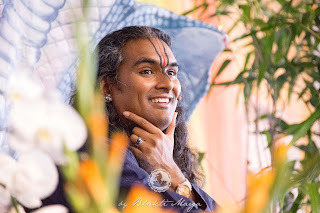 One becomes humble by going to His bhaktas (namely, saints who are completely surrendered to the Divine) in order to learn. Uddhava was a dear devotee of Krishna, and his first meeting with the gopis in Vrindavan describes his transformation to humility. 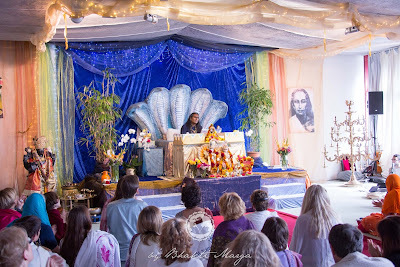 The story begins as Krishna tells Uddhava, "I am Love but I can't give it to you. Go to my bhaktas." 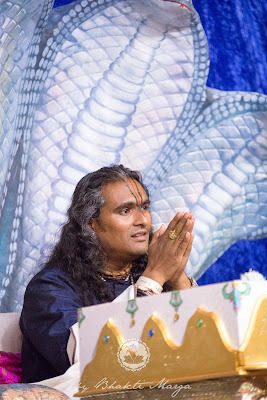 Now, Uddhava was a very learned man, so on his way to Vrindavan, he planned to teach the gopis how to focus on the formless God, based on the scriptures that he had been trained in. However, once he arrived, the gopis told him they didn't feel anything from hearing his philosophy, but they knew Krishna in every moment of their lives. They experienced Him continuously. By Uddhava being with the gopis, he was able to experience Love directly - which was not what he'd only understood theoretically before. Uddhava had not felt that Love before, but by being in the presence of gopis, he felt Krishna's Love through them. The Dashavatara (the "10 incarnations"): We heard the stories of the remaining 10 central incarnations of Narayana, including Matsya (the fish), Narasimha (the lion-man), Vamana (the dwarf), Kurma (the turtle), and Parasurama (the axe-wielding warrior). These stories are very powerful because, while they tell about events that seem to take place in the external world, they each represent a specific approach to spirituality within each of us. Devotion and surrender: We heard the stories of great bhaktas, who dealt with extreme trials with transformative devotion and surrender to the Lord. We heard about King Ambarisha (one of Swamiji's favorite stories), who was threatened by an angry sage with death for breaking his fast. We also heard about Gajendra - the famous story of an elephant who was attacked by an alligator. With no one else to help him, he called out to Narayana, who rescued him. 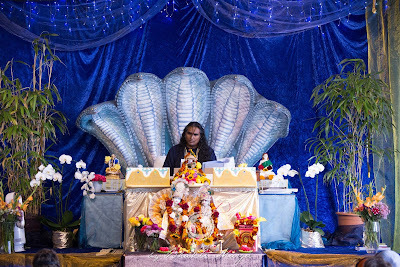 Sadhana and humble determination: Swamiji spoke during the fourth day about how one should approach one's sadhana with a daily attitude of hope. He said that in the morning, one should wake up, focus on God, and say, "I will see Him today!" He reminded us that God might seem far away, but in reality, every day we have the potential of reaching Him. Swamiji followed by saying that if you've not seen Him today, humble yourself. It's only through humility that He will reveal Himself. The battle at Kurukshetra: teaching Arjuna the Bhagavad Gita, and helping the Pandavas re-establish their kingdom. With all the adventuring that took place in Krishna's life, however, the repeated core theme of the life of Krishna in this course with Swamiji was the devotion of the gopis. 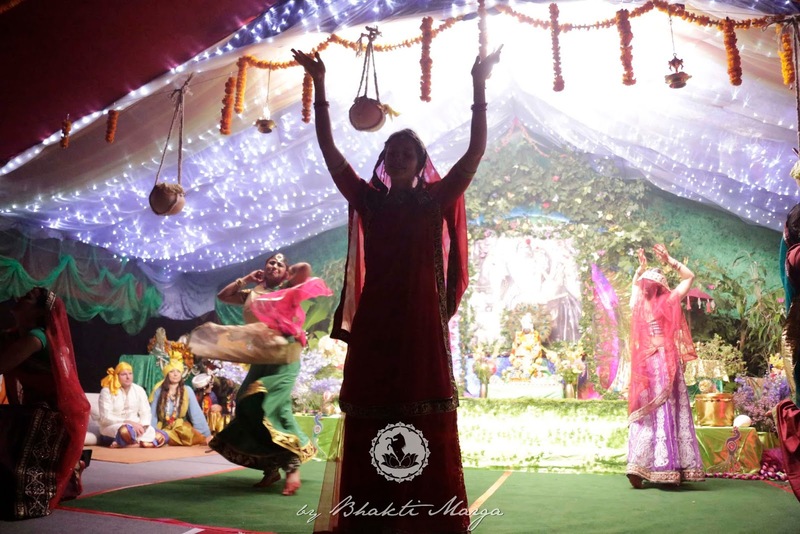 Towards the end of Krishna's stay in Vrindavan, the Rasa Leela took place - the mystical midnight dance of Krishna and the gopis. At the beginning of telling this story, Swamiji said that this was the heart of the Shreemad Bhagavatam itself. 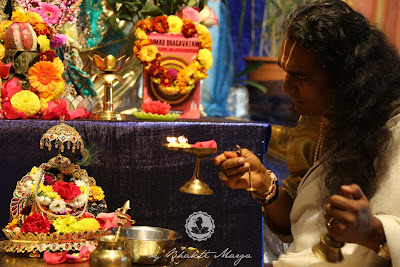 The Rasa Leela started one autumn evening, when Krishna went out into the forest. He started playing His flute, which was heard from all over Vrindavan by the gopis - wherever they were, they immediately knew that Krishna was calling for them. To go immediately to see Krishna, they left whatever they were doing - their families, their chores, everything - and went in search of Him. Some of the gopīs were milking cows when they heard Krishna’s flute. They stopped milking and went off to meet Him. Some left milk curdling on the stove, and others left cakes burning in the oven. As the gopis approached the place where they thought Krishna would be, He made Himself disappear. When the gopis were unable to find Him, they searched everywhere frantically. Seeing their search, Krishna appeared among them majestically in the form of Mahavishnu - the Lord of the Universe Himself - and asked, "Who are you looking for?" The gopis bowed to Him out of respect, and asked Him only, "Have you seen our Krishna?" You see, the gopis were longing so much for Krishna. Their heart was burning and at the same time their heart was becoming humble. So the gopis replied, “O Beloved, the lovers, the bhaktas, those who are surrendered to God are never satisfied with the love in the heart. They long to be physically present with their Beloved one. We want to drink the nectar of your Swarupa.” So, here the gopis longing. They could hear inside of them, you know, but, “No, we don't want. We want Your form. It is that which we can identify ourselves with. The invisible God we don't want. He is invisible. What would you do with Him? What name do you give to Him? Which form do you give to Him? The mind can't picture Him. I know you are everywhere. You are present in everything. But the sweetness of the form.” We have a form, we have a mind, we have a body. Our mind is always looking for something – no? - to hang on and that's what we can identify ourselves with. 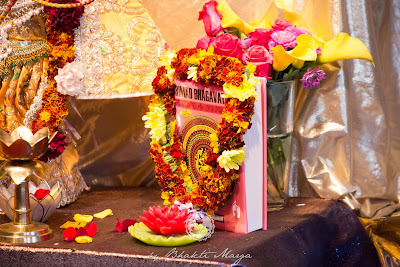 Looking at the Shreemad Bhagavatam course, in short, it was seven days of closeness with God. 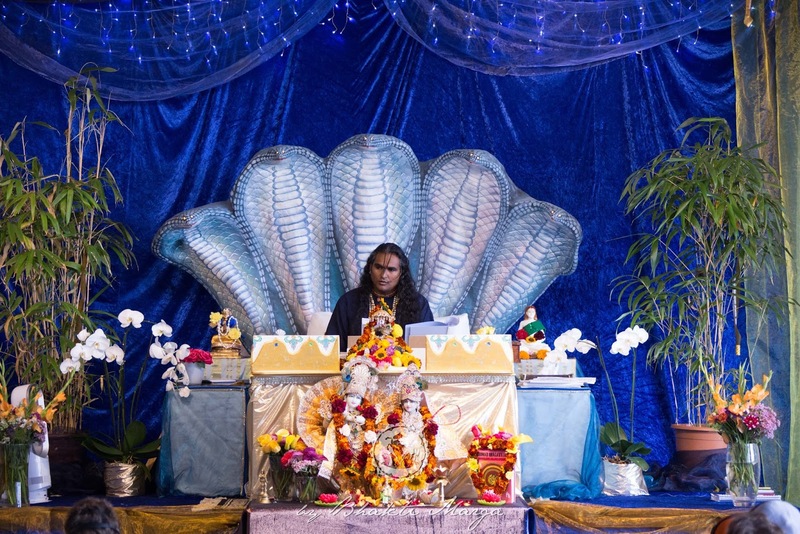 The course participants were able to encounter God in His stories, as the holy book is itself a form of Narayana. The course brought us to 'see' and 'feel' each Avatar's leelas within ourselves. 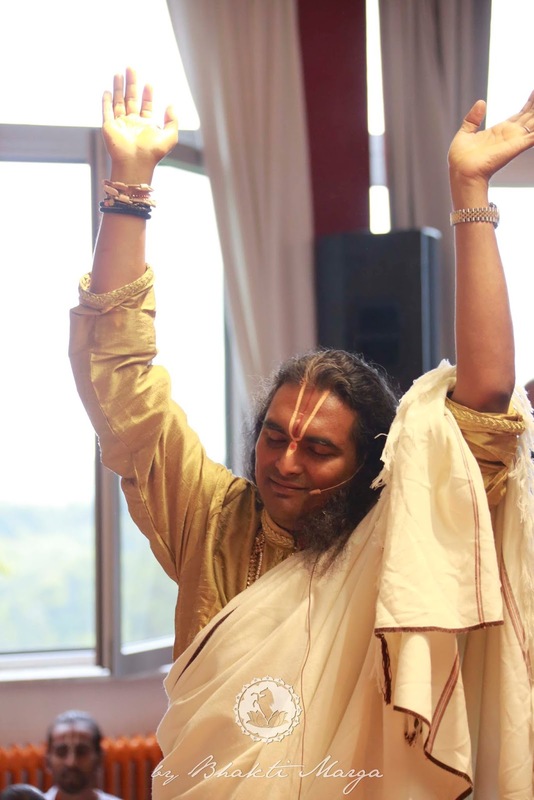 The sweetest encounter of the course, by far, however, was that of God as the Guru, spending time with us to share these purifying and uplifting stories, and helping us to rise in Love. 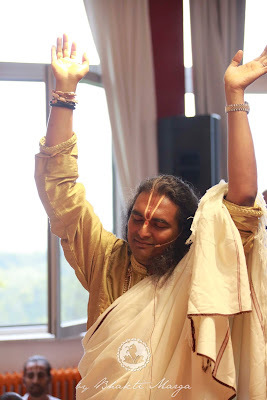 It doesn't matter which form, which Names you take, as long as you have devotion, you have faith, as long as your action is right, your mind is free from pride, you will attain Him. And Bhagavan said, you don't need many lives to attain Him. You need only one life, this life. Forget about all your lives you have taken, you don't remember. Forget about your future lives that you will take, because you can end it in this life. So, don't create any illusion for the future. Because what stops one is oneself. 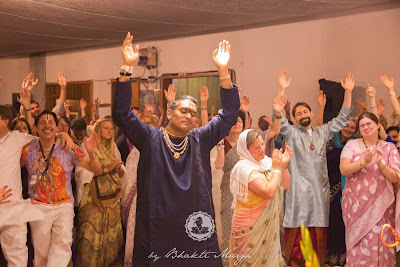 When we say, “Remember God”, so simple, “Become a bhakta, surrender to Him!” What do you say? 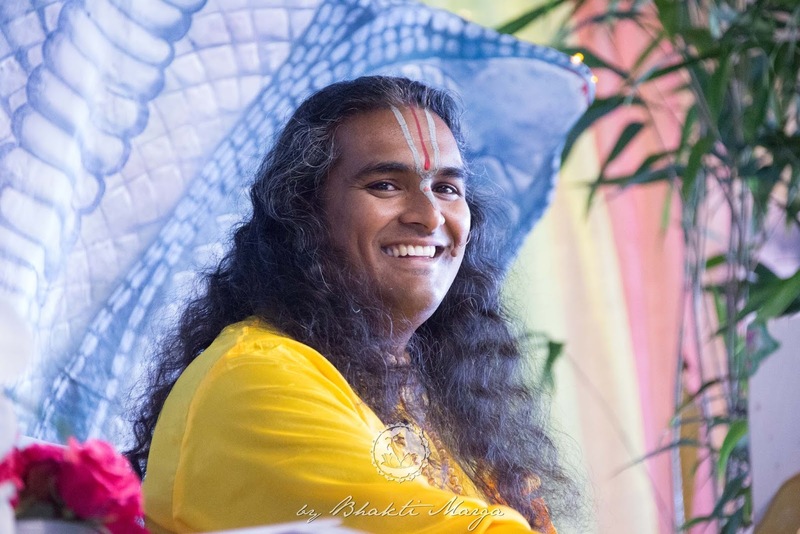 “When will I become a bhakta? When will I surrender? It's too difficult. Too far away.” No? Humble yourself! It's only through humility that He will reveal Himself. He will not reveal Himself if you say very proudly, you know, “I can do that, I can do that, I can do that!” What can you do? Nothing. If He doesn't will it, you will never be able to do. Only by being humble He will reveal Himself to you. The next day try again. It's not wrong to say that you are nothing. Goswami Tulsidas also said, “I am the greatest sinner of all. I don't know why Ramji has given me this task to write Ramcharitramanas.” He is saying that. You see, when the saints - you have heard, you know, in many lives - say, “I am the greatest sinner”, this is to keep them humble. They don't just say it, they mean it. That's why God comes to them, because they humble themselves. They put themselves down. So if they go down, Bhagavan will come and push them up. But if you are already up, how He will push, how He will raise you? Arrogance will not lead you anywhere, only when you are humble. And it is only when you are humble that He will give Himself to you.